This work is recorded in the William Scott Archive as No. 516. 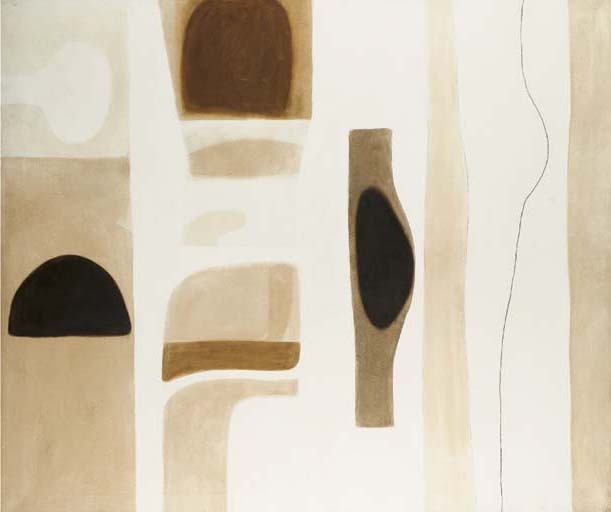 London, Hanover Gallery, 1965, no. 13. Zurich, Gimpel Hanover Galerie, 1966, no. 19. Dublin, Dawson Gallery, 1967, no. 24, illustrated. London, Gimpel Fils, Every Picture tells a Story, 1985, no. 13, illustrated. Belfast, Ulster Museum, William Scott Retrospective, June-August 1986, no. 52, illustrated; this exhibition travelled to Dublin, Guinness Hop Store, August-September 1986; and Edinburgh, Scottish National Gallery of Modern Art, October-November 1986. Dublin, Irish Museum of Modern Art, July 1998, no. 63, illustrated. Writing in the Methuen Art in Progress series in 1963, Ronald Alley pinpoints the artist's approach to paintings of the middle years of the 1960s, 'Though Scott has developed away from still life, the circles and rectangles in his non-figurative pictures still echo the kitchen pots and the table top. He is just as interested as ever in the division of spaces and in creating a tension between a few simple forms; his work is still that of a tonal painter, working within a restricted range of colour. Not only do certain shapes and colours (including a love of pure black and pure white) recur throughout his work, but he has always found it possible to go back to what he had done before. Perhaps most characteristic however is Scott's blend of austerity and sensuality: the one is what saves his work from lushness, the other gives it density and richness and, at times, a primitive, instinctive immediacy rare in British Art' (see R. Alley, William Scott Art in Progress Series, London 1963).